Version V5 is identical to the previous V4, but it has all the connectors on a grid with step 2.54 mm. 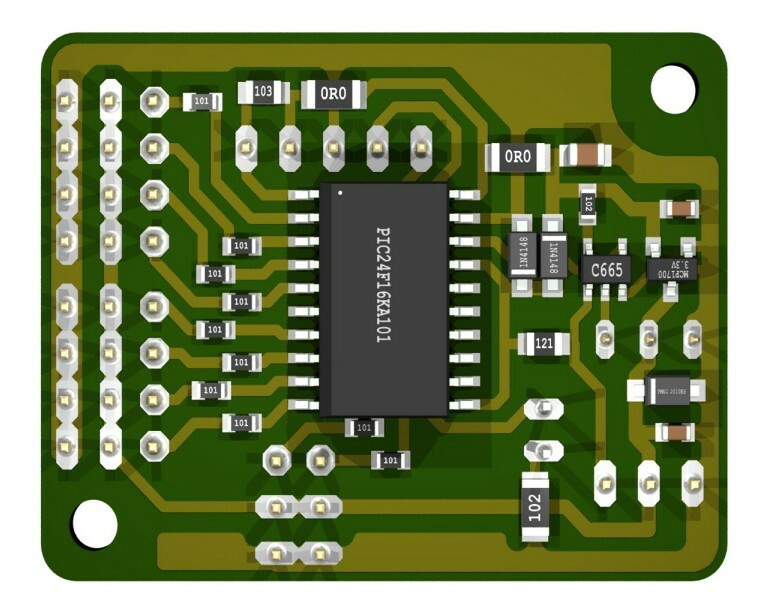 To use this new version doesn't have to learn anything new, you use exactly like previous versions, the Pin layout is almost identical and the Firmware is interchangeable. 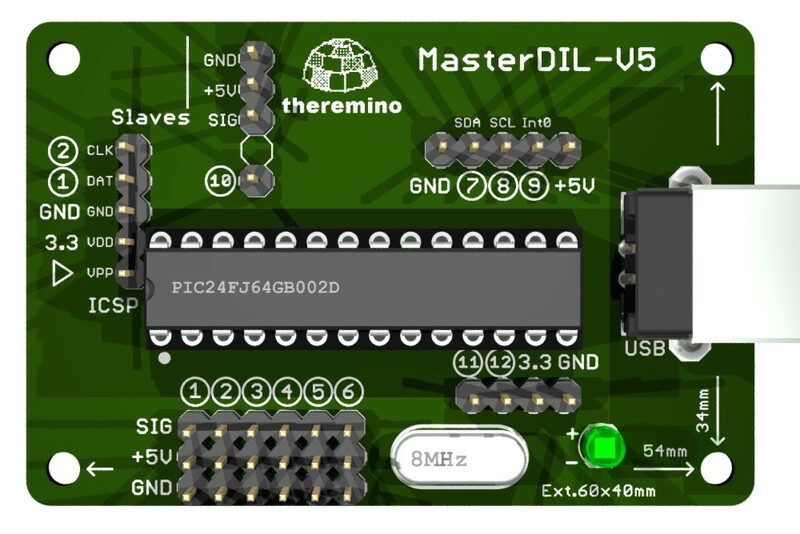 Firmware V5 that you download from here is usable even on earlier versions of the Master (V4, V3, V2) and even on the first prototypes and DIY versions. 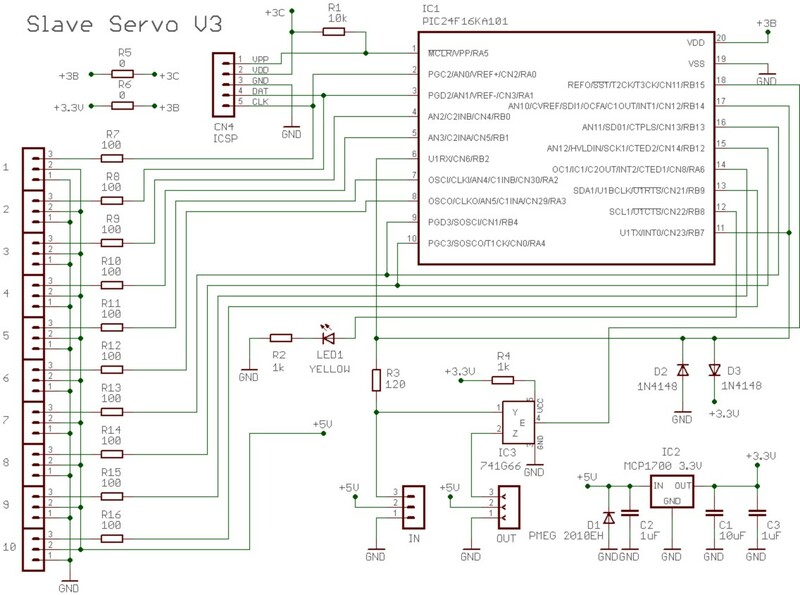 With firmware V5, as well as being able to connect the Adc24, you have a total of 12 In pin-Out, You can control up to twelve generic Pin, or up to five plus two generic Pin stepper motors. STL files are also available to print a plastic support for the Master module 3D printers. 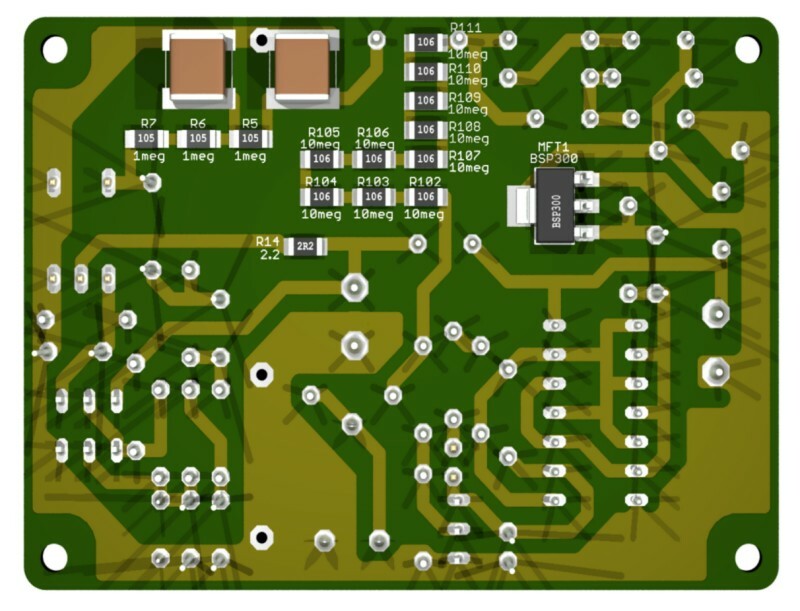 This is the complete design of the PCB in Eagle format, with diagrams, Assembly plans and 3D images. Also includes the HEX file PicKit2 programmer, Pickit3 or similar. In this new version, locate the positions of the pins are easier, Why are represented by a circle. Also the new Pin (7, 8, 9, 10, 11 and 12) are referred to by their number. 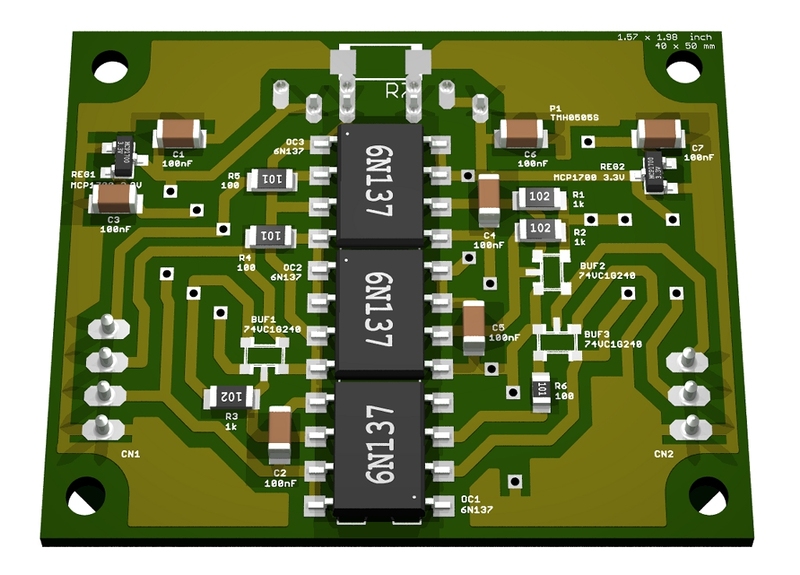 The PCB is simplified and reduced component count to increase reliability. 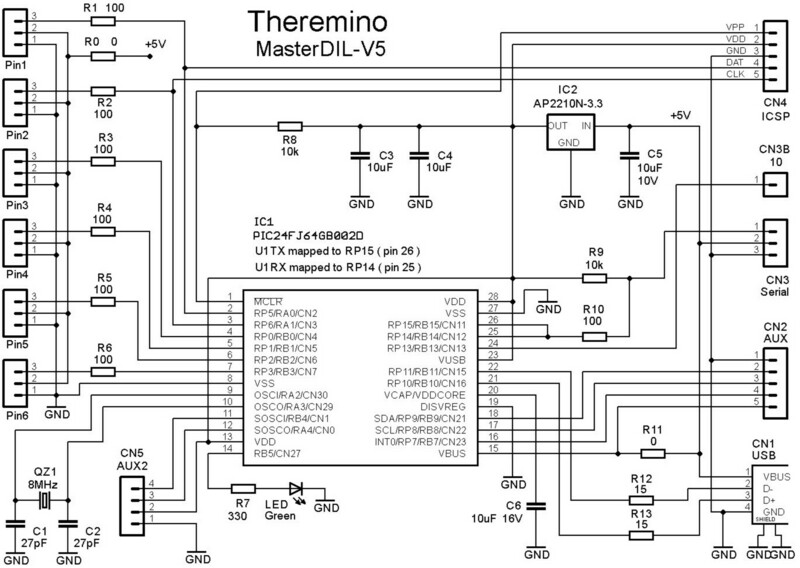 The new version of firmware, also implements the reading of two phase Encoders and pins 11 and 12. The small cylindrical quartz, which was present in earlier versions, was provided for the calendar, but it has never been enabled. So its lack does not determine any difference. We therefore decided to delete it and to use his connections to the pins 11 and 12, they are much more useful. Anyone wishing to use the firmware Version 4 on older PCB version 3, should remove the cylindrical quartz and solder two males for the pins 11 and 12. If you do not use these pins, You can also let the Quartz, which does not generate no noise. 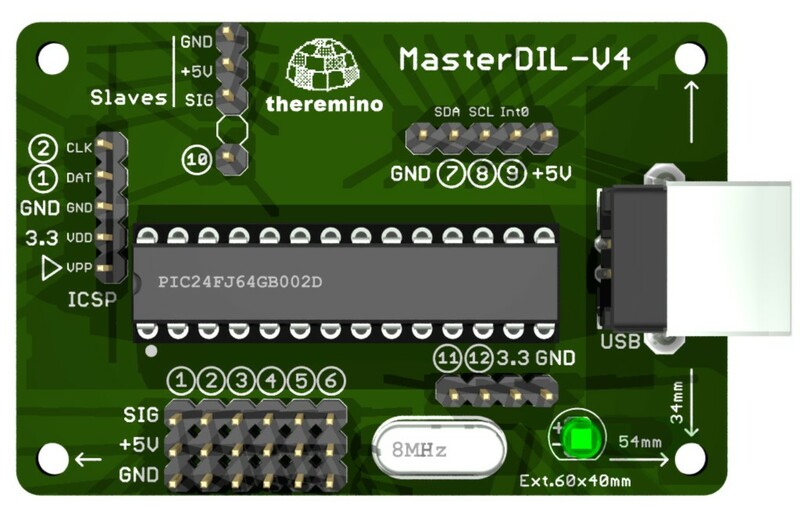 To use this new version of Master you should not learn anything new, you use exactly like the version 3, the Pin layout is almost identical and the Firmware is interchangeable. Who knew these languages could open the file in Open Office, fix them and send them to us. For other languages, you can take the file and have it translated to English: www.onlinedoctranslator.com/translator.html that is great, a breeze and respects the formatting. 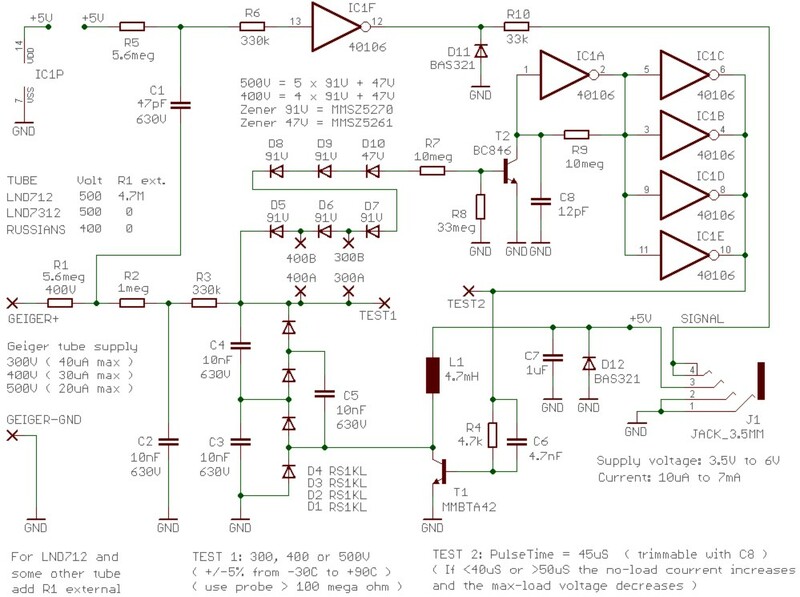 For recommendations on the connections between sensors and the pins, read this page. 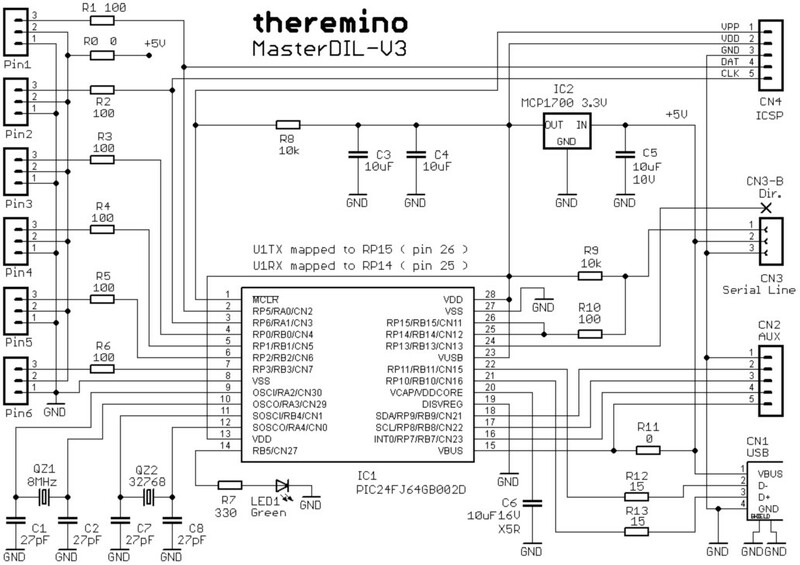 The PCB has six “PIN” (ten in the latest versions of firmware). 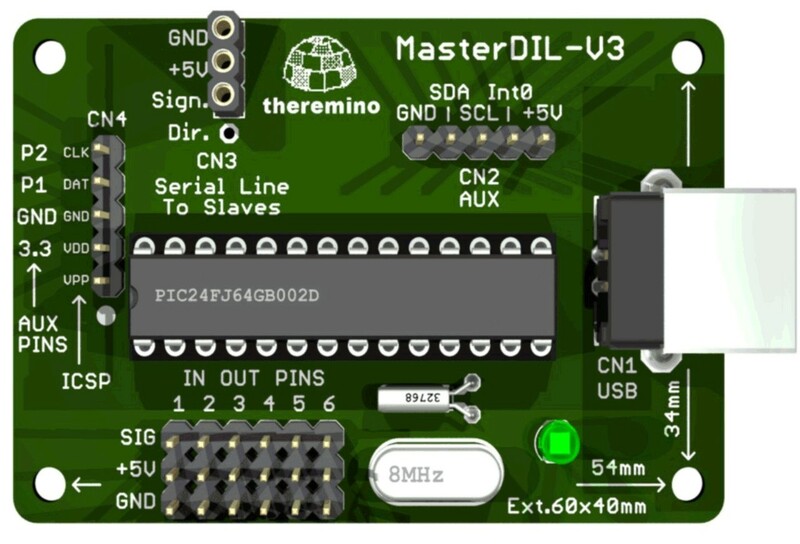 The Master Pin can be used directly, no need to link modules “Slaves” to the serial line CN3. The connector CN2-AUX connect auxiliary devices, which counters, frequency meters and I2C devices (*). 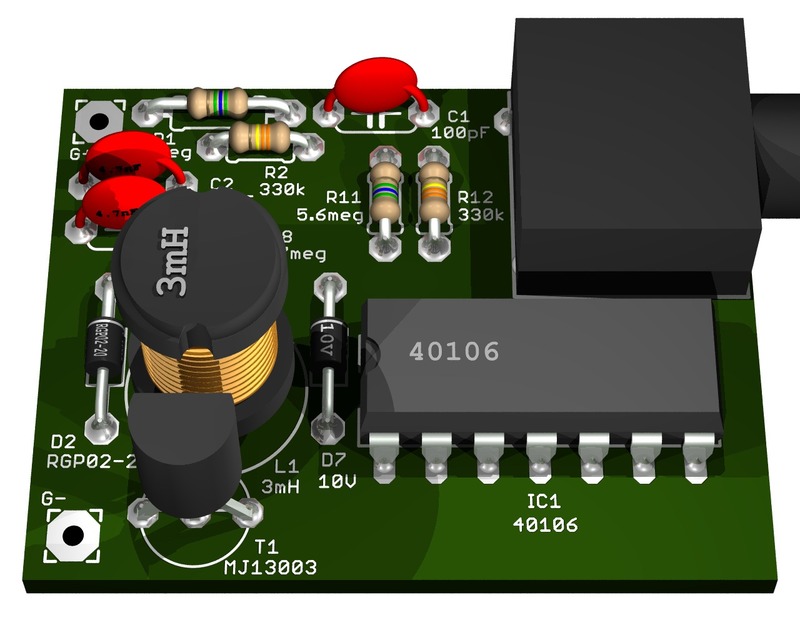 The connector CN4-ICSP allows easy programming “In circuit” with PicKit3 or similar type programmer. 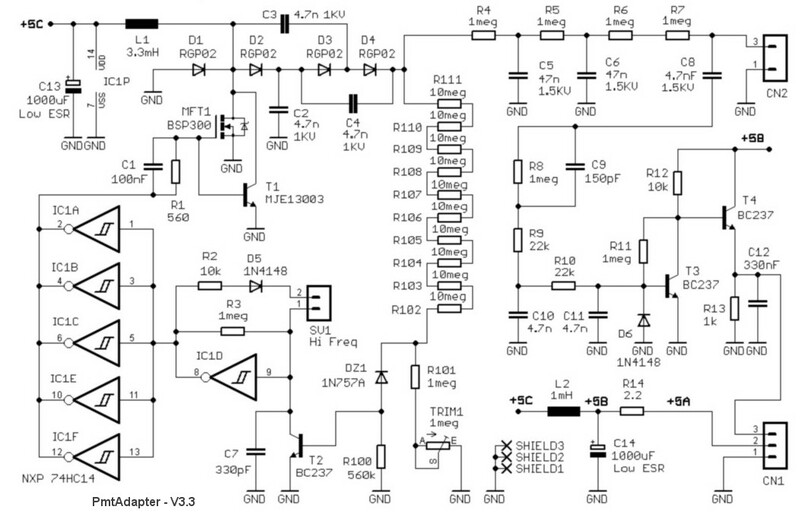 All pins work between zero and 3.3 Volts, both input output. Special pins 7, 8 and 9 also accept signals from 5 Volts. With the new firmware from version 3.2 onwards, the number of pins increases from 6 to 10. Also available are new types STEPPERS and PWM_FAST. 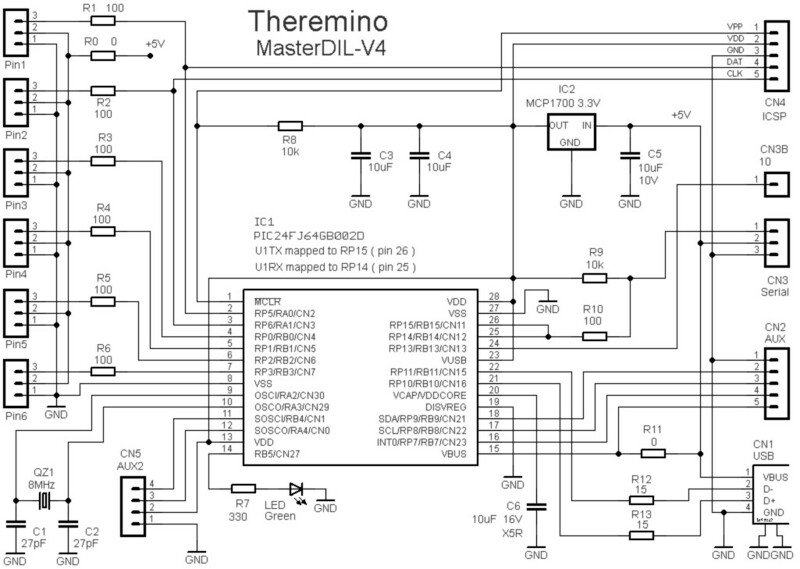 See "notes to the Master module and for the stepper motors. This is the old version of master DIY (for the nostalgic) You should not use it but to use the new MasterDIL-V3 that contains many improvements. However the firmware does not change from version to version of PCB. Those who know these languages could open the file in Open Office, fix them and send them to us. For other languages, you can take the file and have it translated to English: www.onlinedoctranslator.com/translator.html that is great, a breeze and respects the formatting. 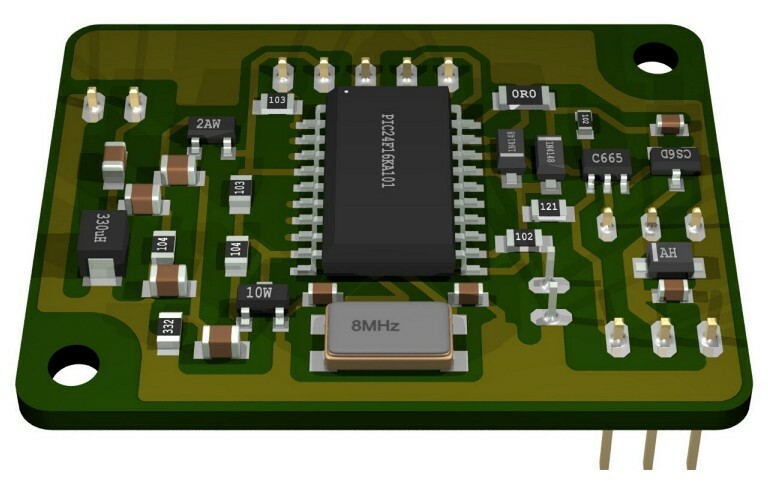 This module provides 10 Standard Input pin. Multiple slaves can be connected in cascade to further increase the number of InOut. 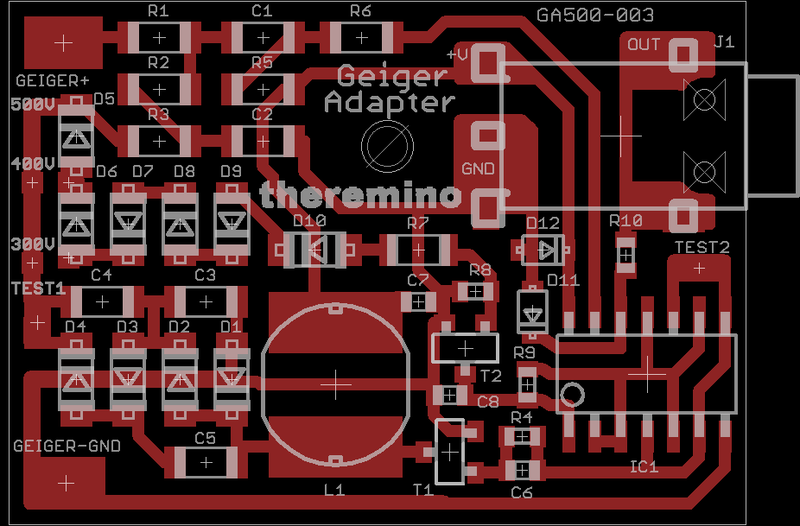 Servo modules do not have the corresponding Pin type Stepper and FastPwm. 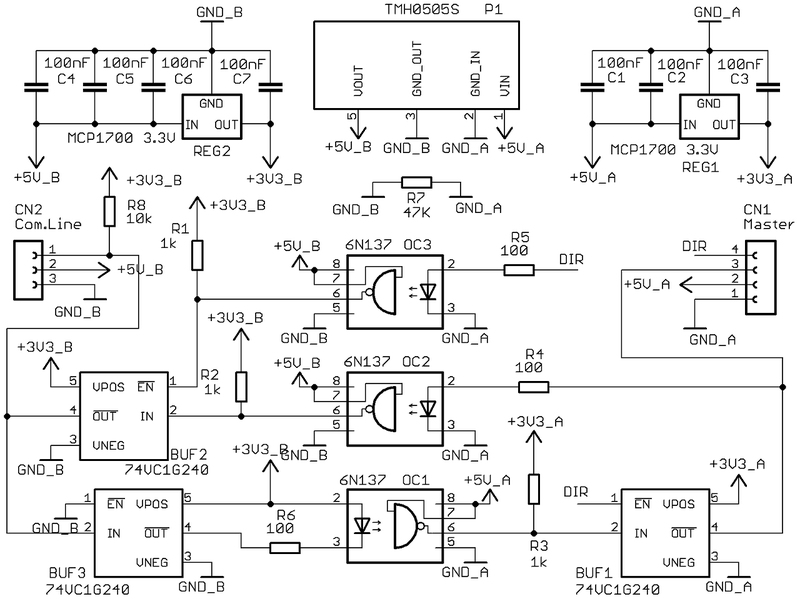 This module provides ten generic output input Pin. In addition to the sensors and actuators can be connected to the servo motors of all kinds. The construction, the calibration, testing and components of CapSensor are critical. Just, for example,, that is not right L1 brand (TDK), to considerably damage temperature stability and background noise. 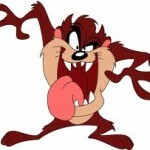 And TDK are found only by Mouser (20 Euro shipping). 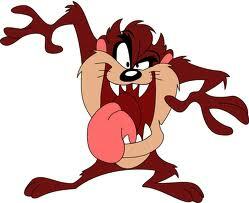 Effects are not to be neglected, switching from a range of several meters, a few centimeters. We want to avoid disappointment to car-builders and avoid us, having to adjust, via email, modules not working. Besides, If you count the time, to test and calibrate the firmware and all problems and disappointments, It costs much less buy them that make them. Therefore we advise you not to auto-build these modules. To avoid disappointment it would be better not to publish the firmware, but since all our projects are Open Source… We also publish the new version of firmware with the new algorithm to “Dynamic latency”. Incredibly low latency (up to 0.8 mS) When my hand is near and is moving fast. High accuracy by means of a long integration (up to 16 or 32 mS) When the hand is far away and moving floor. The tradeoff between latency and stability of notes (that is the big limit of all the Theremin), is improved by about 20 times. With the new firmware, the actual value of the latency is visible in the small window of parameters of HAL, under the graph of the oscilloscope (use the latest version of HAL). In version 2 We also improved event handling of interrupts and LowPriorityActivities. We thus removed small hops, that occurred to some particular frequencies of oscillator, and when the tainted value was exactly 458751 (6FFFF). Check that the line is stable and not noisy. Normally the line drift slowly upward or downward and is only slightly rougher. Do this test without antenna and holding perfectly still on CapSensor and his strings. ATTENTION: This is a deprecated project. When it was designed there were no commercial alternatives apply, but now there are USB and line insulators are fairly inexpensive. Isolate the USB line is better than isolating the only serial, you get a total separation between PC and IN-OUT modules. For which this module was never produced and was tested shortly. We do not recommend building it. This power supply, It has great features, consumes very little (from 10 but to 30 mA) and stabilizes the output voltage, in order to maintain a constant scale of energies. The output signal is conditioned in such a way “Gaussian” and “bipolar” for maximum measuring resolution. 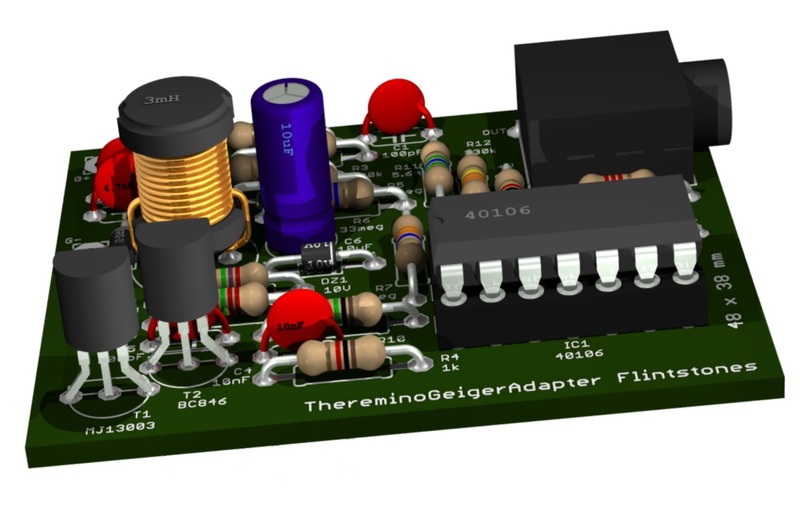 The transistor T1 is an alternative to the mosfet MFT1, If you mount one mounts the other. With the mosfet efficiency is greater. 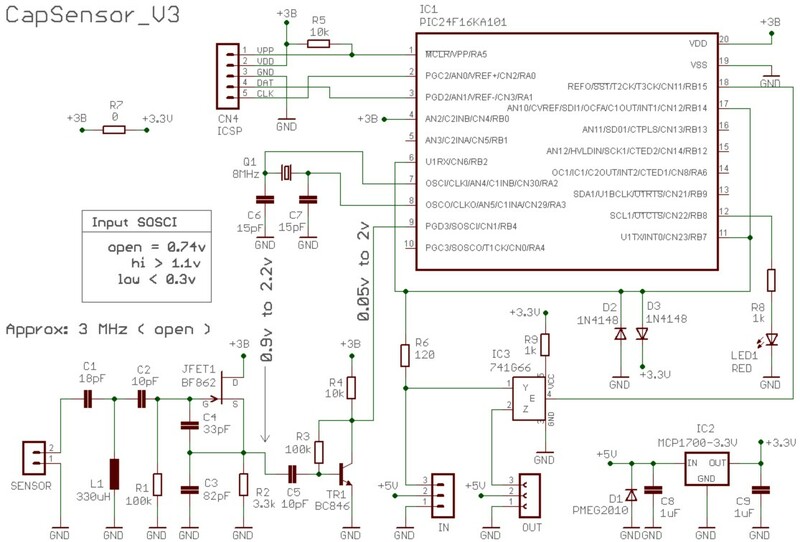 For recommendations on the connections between sensors and the pins, read this page. The normal range of this power supply is from 500 to 1000 volts. Replacing R101 you get a range from 700 to 1500 Volts. And’ can also go down to 100 Volts and up to 1800 Volts (raising R101 tension subsides and vice versa). 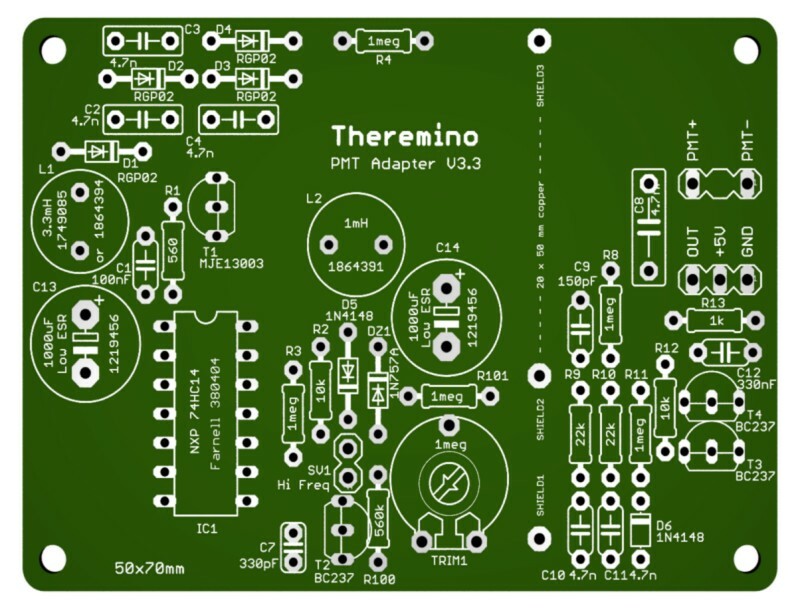 And’ You can also connect a Geiger tube instead of the PMT and send impulses to ThereminoGeiger via ThereminoMCA or via ThereminoAudioInput. This way you can feed even Geiger tubes from 900 Volts and beyond. For pipes 300, 400 or 500 Volts you can extend the range downward adjustment by increasing R101 or using a Qtr1 from 2.2 or from 4.7 Mega. Adjustable tension also allows you to experiment and measure the unknown Geiger plateau. This power supply, It has great features, consumes only 10 UA, able to operate from only 3.5 Volts, its output is very stable and easily adapts to all municipalities Geiger tubes. The normal range of this power supply is from 300 to 500 volts. The tensions 400 and 300 Volts are achieved by activating the points marked with 400B or 400A 300A with 300B. 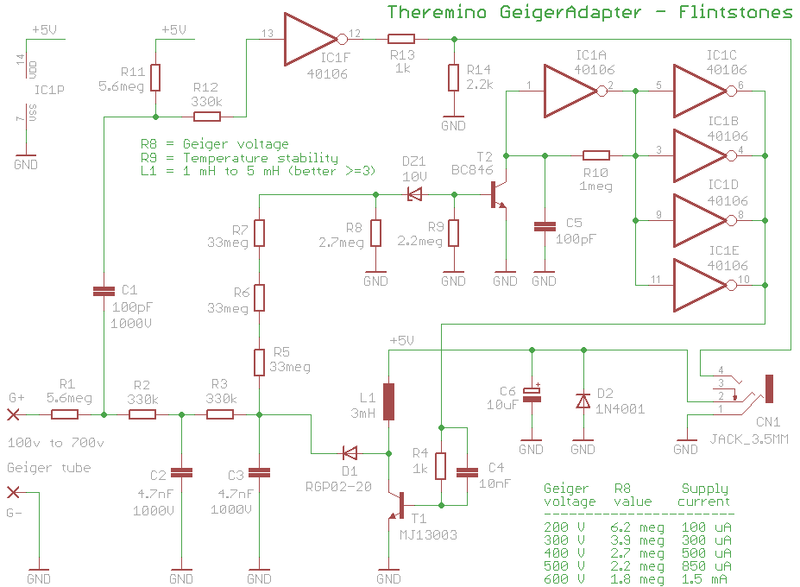 The Geiger tube must always be connected at touring “Geiger +” and “Geiger GND”, do not connect the cables from the Geiger tube the plots called 300, 400 and 500, which are intended for the voltage selection. The actual voltages are kept slightly low, in order to make work the tubes in the lower half of the plateau (This slightly decreases the sensitivity of Geiger but greatly reduces the number of pulses spurious products) You may experience this effect with a counter-evidence: If you run a Geiger near the maximum voltage sensitivity grows slightly but the number of pulses of background gets very high, until, arriving at the maximum voltage of plateau, the pipe starts to download constantly and produces thousands of spurious pulses per second. For tubes from 300 Volts (they have a narrower platform) the reduction is a few volts while those from 400 and from 500 you work in practice about 380 Volts and 475 Volts (the 5% less than the rated voltage) This improves the stability of the rows when the impulses to be measured are few compared to those produced by tube, Basically when you measure the environmental fund. For pipes that need 10 Meg, as the LND712, you add a resistor from 4.7 Mega in series with the positive wire going to the Geiger tube. This causes the 4.7 Mega exterior, is added to the 5.6 Mega on the printout and you will get around 10 Meg. In a non-SMD diodes D1, D2, D3 and D4 may be replaced with the RGP02-20. In any case you should use zener with very low leakage current otherwise the tension is not reached or falls when the room temperature grows. If you do not have very low leakage current zener you can replace two resistors R7 and R8 1 Mega. With resistors 1 Mega salt consumption by normal 10 UA up to 150 UA but the diode leakage current becomes tolerable. A Council: Don't do this at home! The components are critical. The construction techniques must be adapted. 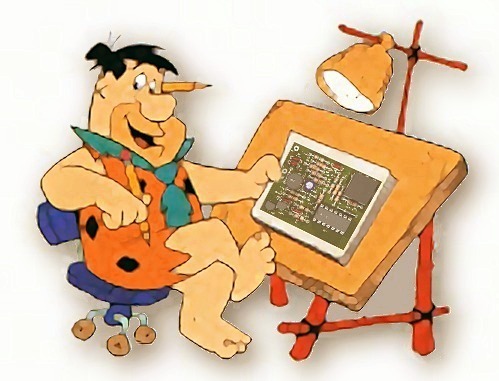 Choose rather versions: DIY and Flintstones. 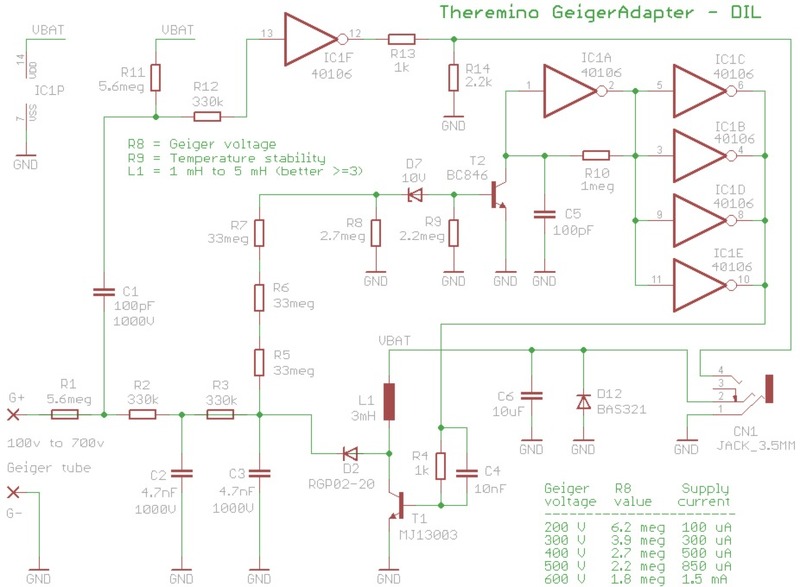 Some auto manufacturers have requested a GeigerAdapter, easily Constructible. So we designed this version just for them. 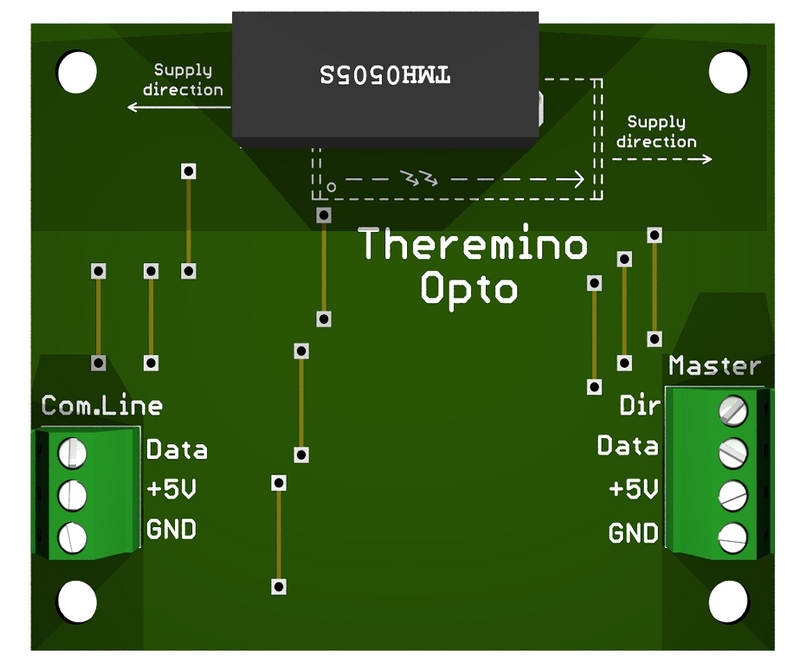 All components are readily available but there are three or four SMD components at the bottom. Those who want a larger version, Constructible even on a thousand-holes, can use version “Flintstones” discussed in the next section. The power consumption is low enough (from 100uA until some but depending on the output voltage set). 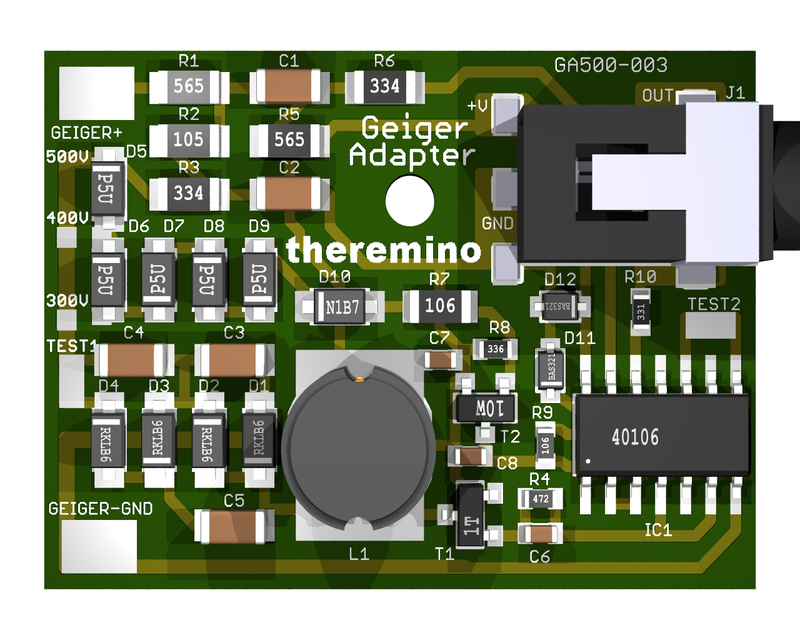 With common components, and without the zener with very low leakage current (only available in the USA with 30 Euro shipping) You can't get incredibly low consumption of our SMD version (10 UA). The electrical characteristics are the same as the previous version DIY. The voltage for the geiger can be adjusted from 100 Volts up to 600 Volts and beyond. The wiring diagram shows the power consumption and other useful details. Attention: There are unapproved copies of our forms. These products differ mechanically and electrically by our projects and have a Copyright, so I'm not really Open. According to our rules are unreliable and poorly designed products, see here. So we won't provide updates and support for them. 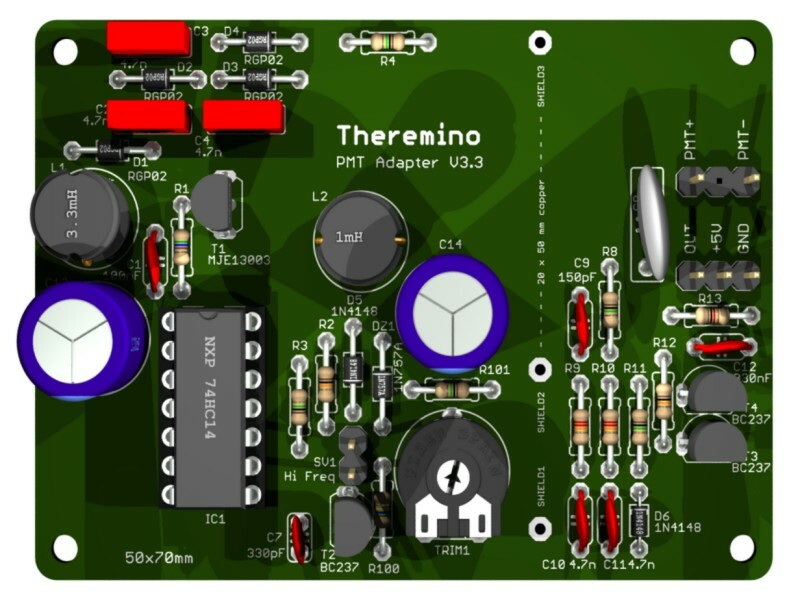 The only products manufactured by following our instructions, can be found at: thereminoshop (Shenzhen China), Amazon (Yuntab-WaveGroup), eBay (Maxtheremino) and, handcrafted construction not for profit, Alessio (makers@theremino.com).